2 aircraft) to discover hidden treasure (mainly teeth in need of rescuing) and explore uncharted waters teeming with Unidentified Scary Things (the well trodden paths of the Great Barrier Reef). this vast and wild land so that they could conquer and be a prosperous nation (been there done that, mission accomplished!). land and go in search of the biggest scariest most toothy sea animal (sharks) and train it to become the most compliant, dentist loving, regular flossing patient ever (Uhm...ok... I didn’t read the fine print, but I’ll try). After arriving in the Land Down Under it took me no time at all to sink my teeth into dentistry again. The sad news is that after 2 months I have yet to sink into a body of water with my Scuba gear. Oh well, back to the teeth. Q: My son Johnny has always been a slow developer in the tooth department and had his adult teeth comingthroughbehindthebabyteeth.Heistenyears old now and wants to follow in Dad’s footsteps and start scuba diving as soon as he can. He still has two rows of front teeth though and looks like a shark! What should I do about this? rows of menacing teeth ready to snap off a finger if you’re not careful. This condition where the adult teeth erupt behind the baby teeth due to over-crowding is indeed called Shark Teeth in Children. This is a fairly common condition, affecting about 10% of kids in the mixed dentition phase. It typically lasts between the ages of 5-13years old, but can often be longer in kids with delayed eruption patterns like your son. the jaw arch, resulting in the well known mobility and loss of baby teeth allowing for good alignment of the adult teeth. I would, however, recommend an orthodontic visit to assess the overall crowding and developing of Johnny’s adult teeth in the jaw bone and if necessary, to do a carefully planned extraction programme. Should he be required to wear braces due to the crowding, the diving should not be affected at all as the teeth and braces cannot be compressed. A little care should be taken with the mouth piece, but generally this does not impede upon the diving experience itself. On the up side, at least going snorkelling now, should he run into a shark, he’ll be safe. The well recognised shark teeth condition will probably evoke a maternal response from said shark, followed by a big bonding session with the result you may end up with an overly protective pet shark. It could be worse right? 45 teeth and having up to 7 rows of replacement teeth accompanied by a high rate of tooth loss, the average shark can go through 30,000 teeth in a lifetime. 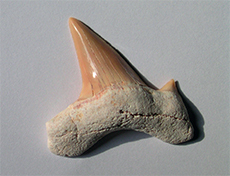 Our ancestors used the teeth of the great white shark as arrowheads. An ancient shark called Carcharodon Megalodon (“rough tooth, big tooth”) had teeth measuring more than six inches long (the largest shark teeth ever found), jaws big enough to swallow an entire car, and a body the same length as T-Rex. Is it possible it could still be lurking in the murky depths of the ocean’s deepest trenches? In my quest for excellence and in the name of research, I will continue with my mission as stated, and start, in earnest, my “taming of the shark” experiment. Wish me luck and until next time – Safe diving and happy flossing! PS: Celehte can still be found singing, drilling and diving away at her new practice in Brisbane. Find her on Facebook.